The Hannam Bridge was commission in 1976 and, at the time, it was considered the foundation of the infrastructure system in South Korea. After more than 40 years of operation, the bridge, as well as hundreds of other same-generation bridges, are aged and deteriorating and reaching the end of their design life. As a result, there is an urgent demand for bridge maintenance or rehabilitation across the country’s infrastructure while also ensuring that construction does not impede the flow of transportation. To ensure that there is a strict monitoring and inspection system and efficient rehabilitation, the Korean government developed a new bridge maintenance system (BMS). The ongoing deterioration of bridges is a serious concern for transportation agencies and emphasizes the need for a cost-effective, proactive strategy to provide preventive maintenance. Therefore, the establishment of a new generation BMS provides a more reliable decision-making process for bridge maintenance. Object-oriented 3D models were utilized to provide the level of detail, analysis, evaluation, and collaborative workflows needed during the design process and support BIM methodologies required for the new BMS system. The bridge maintenance team created a digital twin to be paired with a physical entity and then represent its existence to help with monitoring and data analysis. First, a 3D geometry model was generated using the as-built document of the existing bridge using OpenBridge Modeler. Next, a “reversed” 3D surface model was created using ContextCapture and a 3D scanning procedure. Noteworthy in this 3D model is the combination of photo scanning using drones for the lateral and top surface model, and laser scanning cloud data for the bottom surface model. At the end of this task, the 3D models are overlapped based on predefined marks, which are included within the digital twin and attached to the real bridge before 3D scanning procedure. The overlapped model can be considered as the performance digital twin of the physical bridge, including damage records, and represents the as-is model at the beginning of the maintenance project. Lastly, RM Bridge was used to derive an analysis model from the digital twin for assessing the future behavior of the bridge. Using the digital twin, inspection work can be implemented automatically with a camera and the aid of a damage detection framework, which uses image processing and image tracing methodology. Once the damage is detected, cracks, material degradation, corrosion of steel elements, or other issues are assessed to determine reduction of structural parameters. A chain of analysis cases is conducted according to different combined load cases. The results are then compared and discussed, and the future behavior of the bridge is analyzed. 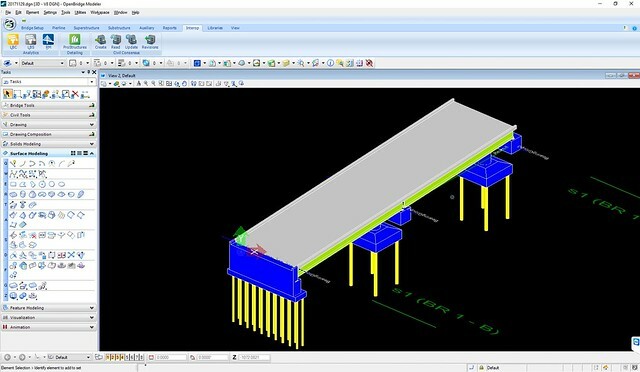 Using digital twins helps the bridge management team determine required repair/strengthening measures in the new bridge maintenance system to better manage the monitoring and inspection system for all Korean bridges.